New generation torque wrench pumps from Enerpac (A Division of Actuant Corp) have been developed specifically for demanding and repetitive bolting applications in industries such as oil, gas, mining and water pipelines and civil engineering, construction, maintenance and metal fabrication. The ZU4 Pro Torque wrench pumps for high duty cycles incorporate the latest Firmware 7.0 programming that cuts out an entire step in the bolting process by enabling users to directly display torque in foot-pounds or Newton metres instead of having to convert them from conventional pressure output readings. Users just have to select the torque wrench model on the pump’s output to make huge time savings through the automatic mode, says Enerpac National Bolting Manager Pat Molloy. Users can either select to display pressure in MPa, psi or bar, or go to the Auto Cycle mode for faster job setups without having to go to hidden menus. 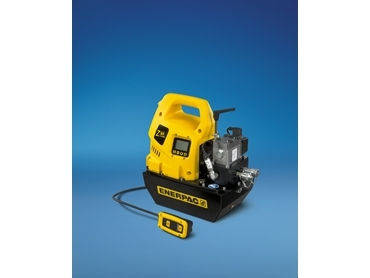 The compact and highly portable ZU4pumps, typically weighing between 32-36kg, are a totally new generation pump from Enerpac engineered to save time and labour on repetitive tasks while improving operator safety. ZU4T pumps can be used for all major brands of 700 and 800 bar single-acting and double-acting torque wrenches, offering auto-cycle for continuous cycle operations and quick, secure coupling by way of Parker spin-on-couplers for 700 bar models and Enerpac lock-ring couplers for 800 bar models. Their high-efficiency two speed pumps feature higher oil flow and bypass pressure (85 bar) for cooler running that requires 18 per cent less current draw than comparable pumps. An optional heat exchanger is also available to provide even cooler operation by removing heat from bypass oil, increasing oil life and reducing wear of the pump and other hydraulic components. The high performance ZU4T’s self-priming first stage increases pump performance by supercharging the second stage piston pump, improving oil flow in both hot and cold weather operations. New generation ZU4 pumps are built to run cooler than conventional designs while offering greater durability, lower operating costs and simpler service in bolting-intensive industries, says Mr Molloy. Enerpac’s ZU4 series feature a powerful 1.25kW universal motor coupled with a totally new pump element design that reduces oil flow turbulence, producing an industrial workhorse with fewer moving parts and less friction. The pumps’ increased flow rates, reduced heat generation and decreased power needs translate into higher productivity and reliability for repetitive applications such as bolting, crimping, cutting, fabrication, lifting, lowering, materials handling, maintenance, pressing, pushing, pulling and production and process engineering. Z-class technology provides high bypass pressures for increased productivity, particularly in applications using long hose runs and in high pressure-drop circuits, or in some applications involving double-acting cylinders and tools.